If Apple or Amazon lost $119 billion in market cap over a three month period, investors would be rushing to exit the stock in droves. So perhaps it shouldn't surprising that when Bitcoin did this very thing for the quarter ending March 31, investors of the cryptocurrency are doing the same as volume and appetite for the digital currency has fallen in line with its decline in price. 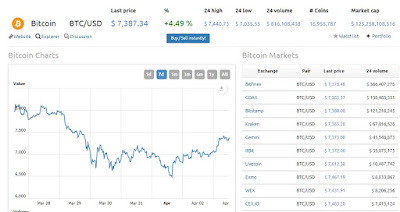 Bitcoin fell from $13,412.44 to $6,928.85 in the three months ended March 31, marking a more than 48 percent decline, according to data from industry website CoinDesk, which tracks the price across a number of exchanges. The cryptocurrency's previous biggest decline came in the first quarter of 2013 when it fell 37.9 percent from $770.44 to $478.72. CoinDesk has only tracked the price since 2010. At its peak in December of last year, Bitcoin's market cap was over $600 billion, and much higher than nearly ever other financial institution on the planet. But even with the price regaining the $7000 handle last night during Asian trading, it has declined by over 65% in just the past four months.